Yes, our latest 3D stop motion animation called “The River” is now available for your viewing pleasure (well, the 2D version is; we’ll keep you posted on the 3D). 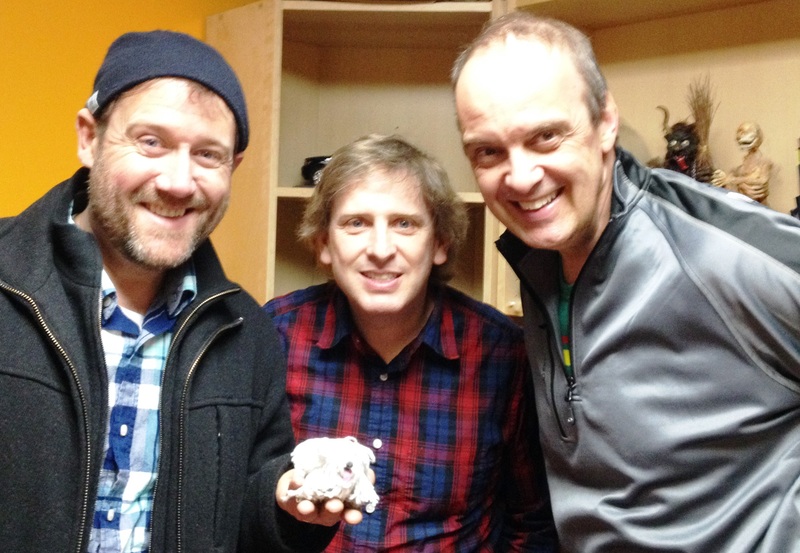 March 2014: The Arrogant Worms (Chris Patterson, Trevor Strong, and Mike McCormick) hesitantly respond to Leo’s invitation to visit the Bleeding Art Industries studio. They make it out alive. Leo’s not really the stalker fan they were suspecting he might be. Trevor gives Leo signed copies of his book “Very Grimm Fairy Tales” as a token of dark comic kinship. Leo takes a picture of them with Istvan, the puppet dog and celebrity hound from Bleeding Art’s upcoming film Mary and The Looking Glass. April 2015: A year has passed and 1500 hours of talking different ideas, hearing the sounds of River of Snot reverberate repeatedly throughout the building, building props, and moving Mike’s head around (no, this isn’t The Exorcist version), manipulating little Trevor and Chris gobs in kayaks, have taken place. The River is ready to be unleashed upon the unsuspecting masses. Bleeding Art unlists its phone number and decamps from its location on the eastern side of Calgary. People – will – never – be – the – same – again. Don’t say we didn’t warn you. Thanks Mike for writing the song and to the three of you for giving us carte blanche to play with it. The Arrogant Worms. They’re a Canadian treasure. Hopefully not like the cursed treasure in that pirate-y movie, but that good kind of treasure like Gordon Lightfoot or Celine Dion. PS. We’ll keep you posted on the 3D release. It’s really good….in your face you might say, and we’re hoping to be able to show it on the big screen where you can better appreciate Mike’s nose and the streaming river. PPS. We are also selling props from the animation so you can own your very own piece of The River movie memorabilia. Except for the animated Worms in the credits, they’re not for sale. We think they’re pretty darn cute and we want to keep them around for a while. I’ve been following The Arrogant Worms pretty much since the group formed over twenty years ago. I was always impressed by their ability to combine clever, comedic, well-written tunes with spot-on political statements and satire. I’ve seen them a number of times over the years and although their hairstyles changed (and some would argue their waistlines), the quality of their entertaining writing and singing stayed the same. From “The Last Saskatchewan Pirate” on their first self-titled album in 1992 to “Carrot Juice is Murder” and “Rippy the Gator” (which I spent many moments singing to my daughter when she was growing up) – the band has produced some classic Canadian hits. Indeed The Arrogant Worms are THE quintessential Canadian band; their playlist of songs about Canada and Canadian life is the most extensive of any group on the planet. They have been waving the Maple Leaf longer and harder than K’naan ever did. At Bleeding Art, we’ve been looking for opportunities to produce our own creative content and to collaborate with other artists to do the same. It was in this vein that I contacted The Arrogant Worms on Facebook one day when I knew they were coming through Calgary. I invited them to our shop for a tour and to simply chat and see where things were at with them and if – for lack of a better word – there were any synergies. I didn’t go in with a master plan or any expectations. I wasn’t a stalker fan, or at least was trying very hard not to be one. I was an appreciator of their work and thought we might be able to work together. I knew that opportunities like this didn’t always pan out. I in fact had originally approached a singer of another unnamed Canadian band during a break in a concert to introduce myself and to tell him about our stop motion work and what our company does. Having heard the first set, I thought their music was theatrical, edgy, and ripe for having a fun and interesting animation go along with it. I’m pretty sure the guy thought I was a deranged groupie or something as he didn’t seem very receptive and then never got back to me. Which was probably OK since the band has since broken up, so perhaps that one wasn’t meant to be (I hope that wasn’t my fault). 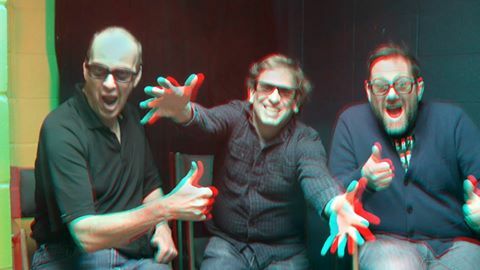 The long and short of all of this is that we’re now working on a 3D stop motion animation to accompany The Worms’ River of Snot, which is on their most recent album, SPACE. We’re testing enhanced 3D using specific modelling styles and are shooting for taking it on the festival circuit starting this fall. We have a few other ideas up our sleeves, some of which we’ll keep you apprised of here or on our other social media sites. If you’re not familiar with The Arrogant Worms, the first starting point is to check them out at their website (www.arrogantworms.com). If this all works out, perhaps Rippy the Gator and Vance the Vegetarian Zombie will be the subjects of our next flights of fancy.